Cruise ships tie up at the center Saint-John Perse cruise terminal, a five minute walk to downtown Pointe a Pitre. The new port terminal cost 1.4 million euros and the capacity of the terminal was increased to 2,000 peope with luggage space doubled and new better defined pedestrian paths created. In addition other amenities were added including a bar and local crafts village. 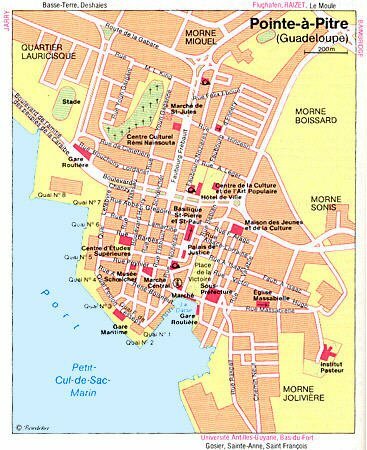 Pointe-à-Pitre The economical capital of the island, counting with its neighboring parishes about 100 000 inhabitants. Its name comes from "Pointe à Peter", the wharf of a fisherman named Peter, who settled there in the 17th century. After having been an English possession for a short period, Guadeloupe became a French territory in the 18th century, when he city grew important partly owing to the freebooters having their headquarters there. The city had been destroyed several times (earthquake, burning, hurricane), therefore little old houses and no architectural uniformity are to be found. Nowadays it is a very animated town, at daytime and on workdays. Big holiday cruise ships stop every day at the city port. Several industrial areas have been created (Raizet with the island's airport, Jarry at Baie Mahault hosting the commercial harbor. Place de la Victoire: a big square surrounded by colonial style buildings, the green heart of the city, facing the mole (la Darse). You also will find the tourist information here. La Darse: small harbor, where the ferries to the Saintes, and Marie Galante used to moor. The put to sea from the Gare Maritime now. Museum Schoelcher: exhibition of the collection of Victor Schoelcher, a deputy who instigated the abolition of slavery in the 19th century, in a beautiful colonial style house with pink and white frontage. Museum Saint John Perse: in an other nice colonial style building, exhibition in memory of Alexis Saint-Léger, poet and diplomat of the 19th century, known as Saint-John Perse. Basilica Saint-Pierre et Saint-Paul: on the square Gourbeyre with its flower market. The frontage is of latin-american style, inside you'll find an astonishing anti-seismic metallic structure. Beautiful leaded glass windows and huge organs are to be seen. Take a ferry to the Guadeloupean island of Marie-Galante (ferries depart from Pointe-a-Pitre throughout the day; the ride takes 60 minutes each way). There you can visit Chateau Murat, a restored 17th century sugar plantation and rum distillery. There are also lovely beaches. The markets: the Darse Market, the Market Saint-Antoine, the Market Saint-Jules and the Flower market at the square Gourbeyre. Spices, fruits, vegetables and tropical flowers are sold in a colorful and noisy atmosphere. The shopping streets: the streets Frébault, Nozières, Schoelcher and the small side streets, where the neighboring luxury boutiques, general stores and souvenir shops create a noisy, colorful and animated atmosphere. Free wifi in the cruise terminal.